The separated wet sludge from the separator is settling down into standard oil barrel where the sludge is packed by the gravity force. 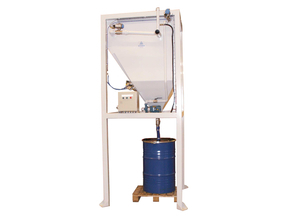 The longer time the sludge is packed in the barrel, the more compact it will be. When the barrel gets full (this is determined by the weight or by knocking on the barrel) it is disconnected from the separator. The barrel is sealed with a standard lid, and the sludge is discharged. This facilitates the management of sludge. Components: The system contains a standard oil barrel with a lid for fluids. The lid is reinforced and equipped hatches and valves. Option: Weight scale and analogue pressure sensor.